…until I just referred to myself as a “grown up.” Let me essplain. Sunday morning I woke up and did NOT want to run. what else is new? As I laid in bed, I kept coming up with reasons not to run or what time I could move the run to. I got out of bed, moved around a bit, and finally talked myself into running. After my run, I showered and got rid of my B.O. stench so I could meet up with some girlfriends without hate-stares. 2 of my friends, S and P, from work had their birthdays in late October. Unfortunately, due to crazy schedules, the only time we all could meet up was on Sunday. Better late than never! My friend SK and I planned a semi-surprise day of fun for them. 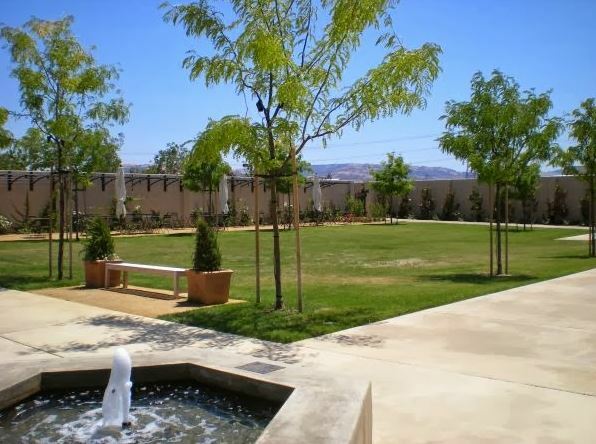 We all agreed to meet up in Pleasanton, and then I would drive from there. That’s all S and P knew 🙂 I really like other peoples’ birthdays. SK and I took the birthday girls to a Thai lunch. We feasted on delicious food, but I told them don’t eat so much that you have to unbutton your pants, cause we got dessert comin’. 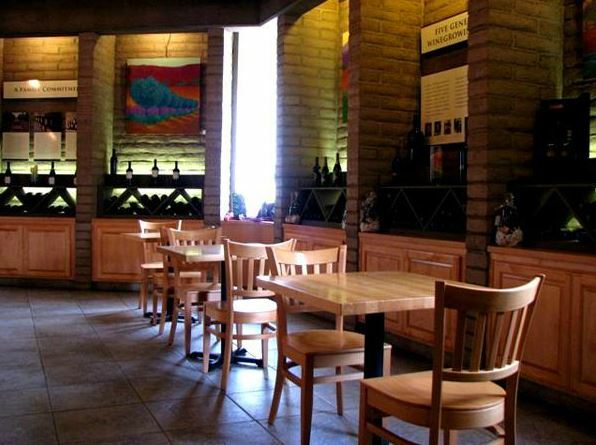 I found out that there are actually 2 different tasting rooms for Wente Vineyards- The Estates and Vineyard Tasting Rooms. We went to the Estates. Guess what guys?! I’m a real grown up now! I tried 5 wines and actually ENJOYED them! I’m freaking sophisticated yo. Oh and I also discovered that I enjoy white wine. After drinking our adult grape juice, we made our way to their patio area for surprise cake. I had picked up a few bundlets from Nothing Bundt Cakes and threw them in a cooler in my trunk. We enjoyed our cake and chatted until closing. They were literally taking the patio furniture cushions away when we left. I bet you they normally keep the cushions out and just wanted to hint at us to get out. Our original plan was to take the girls shopping after the wine tasting, but we took so long being chatty Kathy’s that we didn’t have time! After my awesome girls’ day, I headed home for dinner and then stopped off at Kyle’s house for some snuggle time with my BFBFF (boyfriendbestfriendforever). It was a great ending to the weekend…but too bad it was just that. An end to the weekend. I woke up on Monday and wanted to throw my alarm clock into a garbage disposal. Are you a red, white, or both person? Do you sleep in compression gear? Duh, it’s amazeballs. I generally prefer white because it is a bit milder. I don’t do well with alcohol that is too strong 🙂 as I don’t like the taste lol. Last time I went wine tasting I tried a pinot grigio i really like it. I have a bottle of it now that I am saving for xmas dinner. I tend to drink white in he summer and red in the winter. 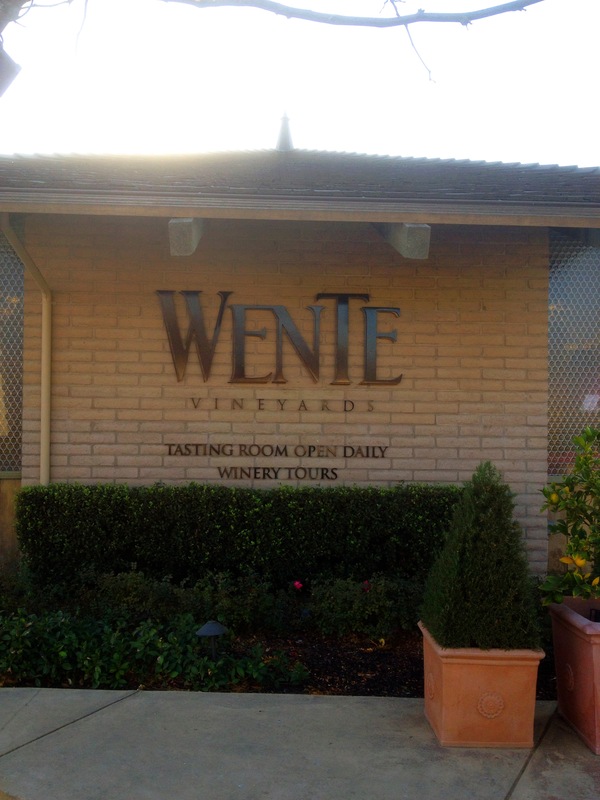 I live in Ohio but I’ve actually been to Wente! I did a tasting and had dinner at the restaurant which was absolutely amazing. Looks like you had a really fun afternoon! It was! And I found out that I love trying new wines too haha! HAHAHA that’s awesome!! Maybe I should try to live like the Irish cause my Sunday’s are usually winding down days. What a fun Sunday! And the bundlets are cute! I prefer white. Reds sometimes makes my sinus stuffy. But! If you want to try something really yummy, try the Framboise Lambic (google it) from Belgium. It is a raspberry beer that does not have the beer taste. (I don’t like beer) It’s more of a intensely flavored raspberry wine cooler with carbonation. It has a low ABV for lightweights like me. When they serve it at a pub they serve in a champagne fluted glass, nice, and it has a beautiful red color. Yum! TJ’s sells it. BTW, the 30 day thigh challenge is getting tough! I feel it! Ooo I’m definitely going to try that the next time I go to TJs! Haha yay! I’m glad you’re sticking with it! You can do it! I drink whatever they pour. Kidding (sort of) White in summer, Red in winter. I’ve been known to put an ice cube in my red in the summer . . . this makes Randy come out of his skin. Winemakers can be so fussy sometimes. Lol! No judging here! I say, drink whatever tastes good to you (and any way you want it). 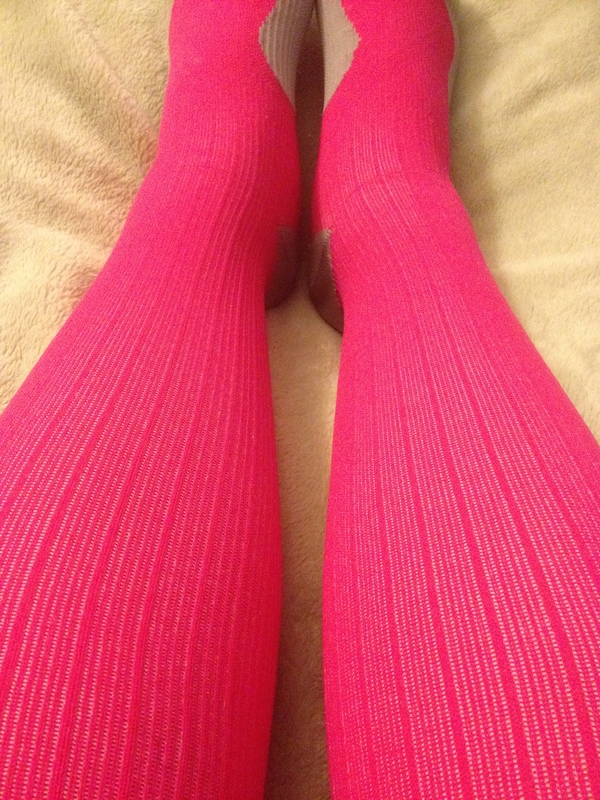 I sleep in my compression socks far more often than I’d care to admit as a married lady…man Zach is a lucky guy ;). But what can I say, I am all about recovery. PS: Twin you are freakin adorable! I wish I could wear my hair in a ponytail and look half as cute as yours! Love it! I can only imagine with that much hair wearing it up would give you AWFUL headaches! One of my good friends growing up had extremely heavy hair and literally couldn’t wear it in ponytails for long periods of time! That’s EXACTLY how I get! I actually get my hair thinned out a little bit, and I can still only wear it up in a bun with clips, or a ponytail for short periods of time. 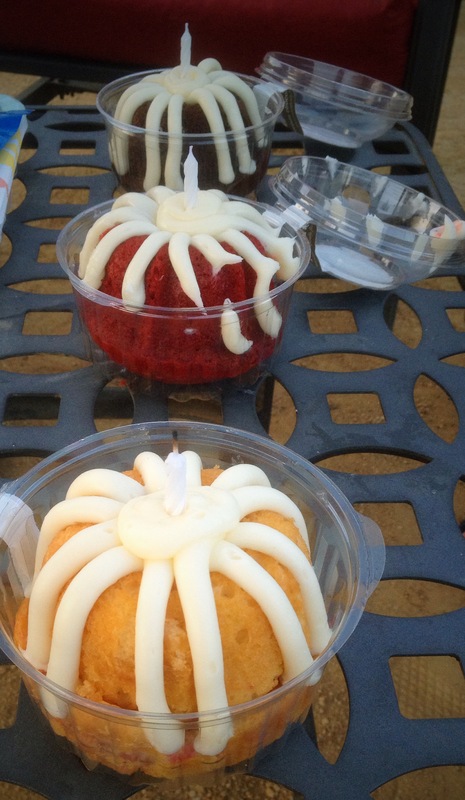 Nothing Bundt Cakes…giiirll that place is sinfully good! 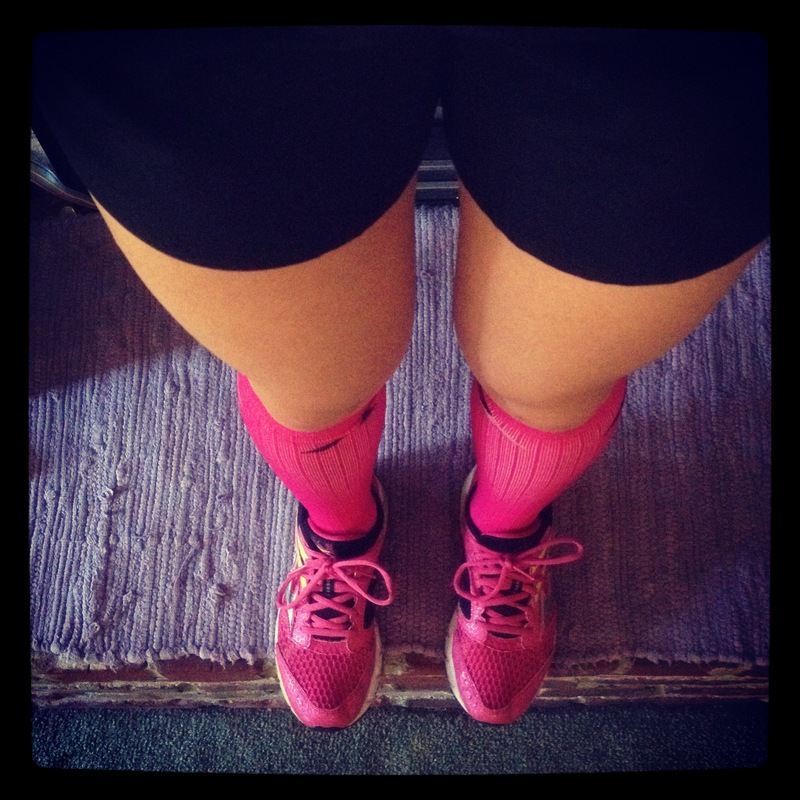 I have those same pink compression socks! Tell me about it! That place is incredibly dangerous 😉 Don’t you love the socks?!! Absolutely! I have slept in them too many a time! I used to love Red wine but haven’t drank much in the last few years (babies). And yes, I’ve worn my compression socks to bed – best decision ever! Probably one of the best reasons not to drink 😉 Haha they are kind of amazing aren’t they? how’s the thigh challenge going? still doing it? Good question….resting on your non-run days would be a good idea or putting off the challenge until you finish your 1/2. You could always scale down the workout to 1/2 the numbers and then increase it after your 1/2 marathon? I’m doing 1/2 of the set in the morning and the other 1/2 of the set in the afternoon/evening…. it’s WAY too much to do all at once. Fun times! I’m a lightweight, too. That’s part of what makes wine tasting fun! I prefer white wine. Anything on the sweeter side but not too sweet. Haha! So true, but I was the driver…next time 😉 I think I’m right there with you on the white wine thing! Heck yeah to you for getting your run in despite it being the last thing on earth you wanted to do (story of my life haha) If you’re anything like me it ended up being the best decision ever! Haha OMG I know! When I went to Europe, my boyfriend and I were like, these Europeans must go crazy when they come to the US and can drink water for free! Pinot Noir is my choice for red, and Chardonnay is my choice for white. It depends on what I’m eating though. I usually choose red to sip on. It sounds like you had a great time with your friends though! Have you tried Entwine? 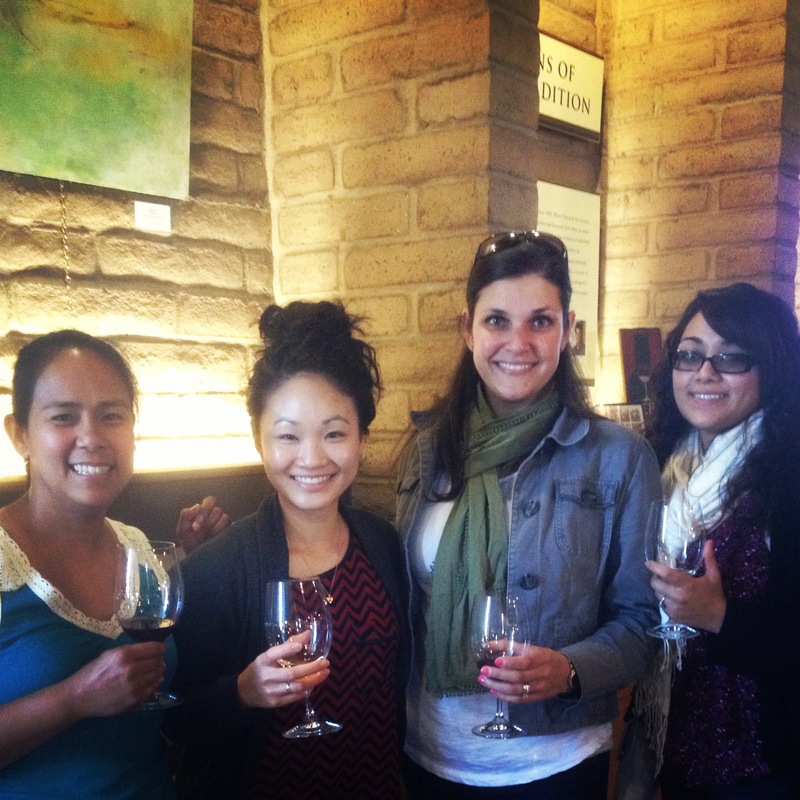 It is a wine made by Wente Vineyards and the Food Network! It is really delicious and I just wrote a post about it earlier today. 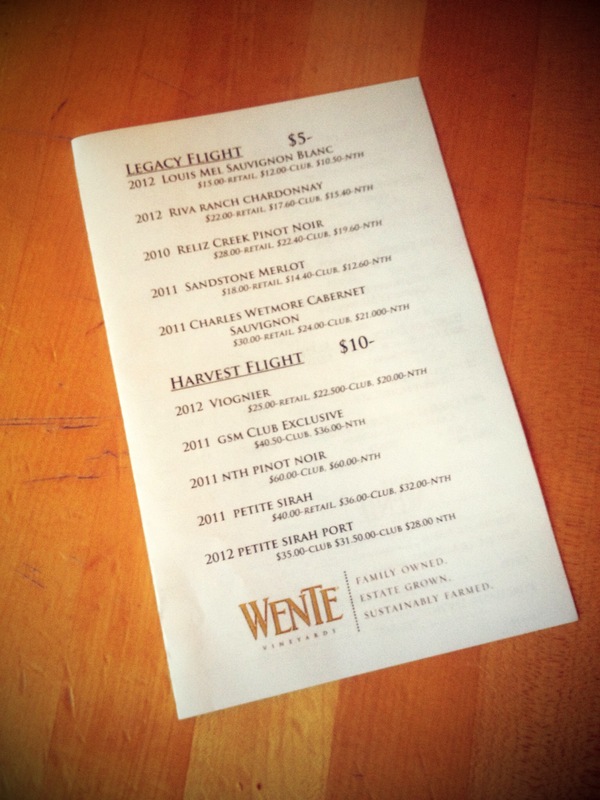 You should try it if you like Wente wines! Enjoy! No I haven’t!! That’s so cool I’ll have to give it a try! Thank you!